“The BT TM-7 utilizes Mini Technology to inflict maximum force from a marker of minimal size. 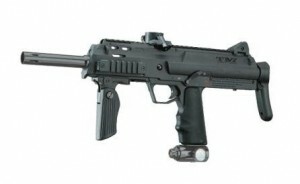 Don’t be fooled by the size of the TM-7’s exterior; it can hang with the big boys and is by no means a lightweight. Once you hold one and pull the trigger, you won’t want to put it down. Its lightweight, yet durable construction is perfect for close quarters or long-range combat. This is the marker that just may have people rethink the way they looked at Mil-Sim paintball markers. There are some downsides worth mentioning as well. Although I like the foldable front grip design he grip itself feels a bit wobbly and somewhat fragile. It’s comfortable though and if you’re careful I don’t believe you’ll have problems with it. Also I’m not so convinced about the durability of the marker. Being so light it almost feels fragile and even though I haven’t heard of any problems on the matter my advice is to be gentle with it. Other than that the BT-7 is a great buy. And I’m sure you’ll like the price as well. Depending on the place you’re getting it you can find the thing as low as $390 or as high as $480, so be sure to check out different places before you make your final choice.